Skin disorder that results in raised, reddish and scaly patches. Pops up as a single patch or several, and can affect the entire scalp. Causes severe itching and discomfort. 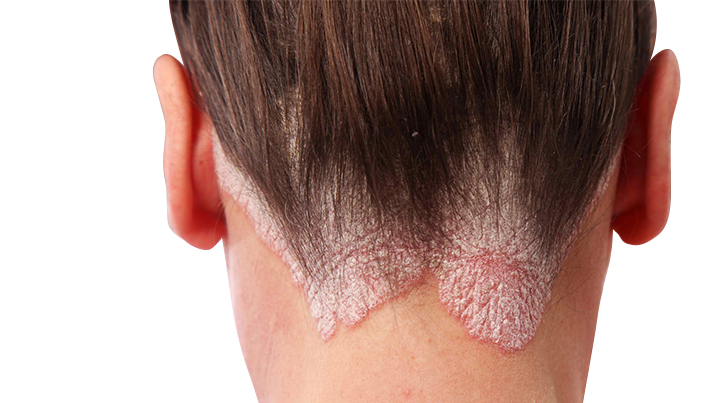 What happens in Scalp psoriasis? Occurs when the immune system sends faulty signals and scalp cells grow too quickly. Causes a silvery sheen and dry scales . Can be very mild, with slight, fine scaling. Can also be very severe with thick, crusted plaques covering the entire scalp. 50% of people who have psoriasis have it on their scalp too. Normally develops between the ages of 15-20 years or later between 50-60 years. Around 75% of patients are affected before the age of 40. Removes dead scalp scales and sebum. Kills the microbe (Pityrosporum ovale) responsible for dandruff. Makes the hair smooth, soft and lustrous.